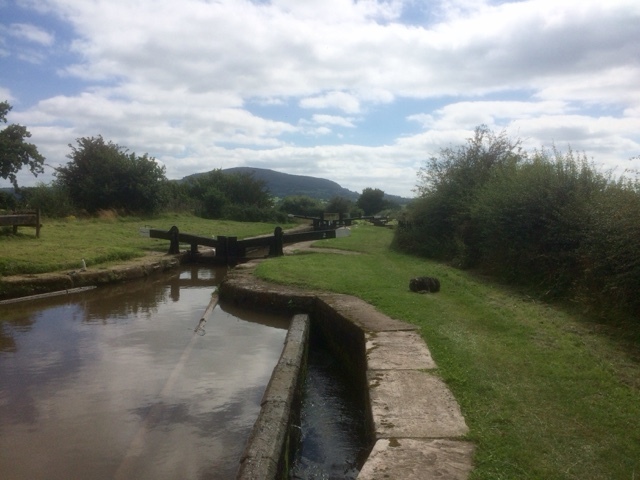 Today we moved the final couple of miles along the Macclesfield Canal to Marple Junction, where we were to join the Peak Forest Canal. We past Goyt Mill on the outskirts of Marple, before arriving at the CRT service block. 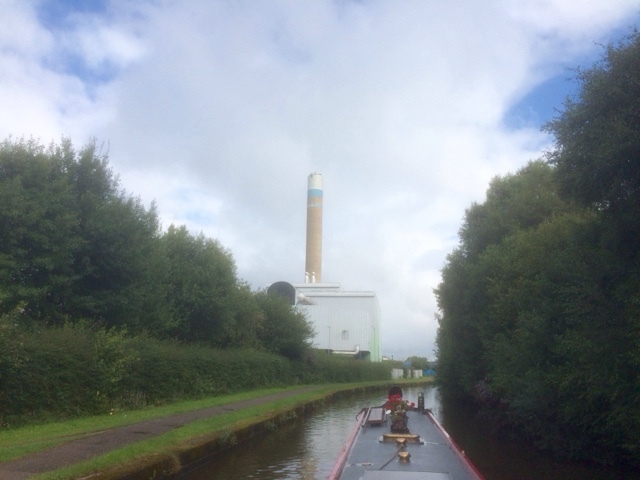 After disposing of some rubbish, we moved through the short narrow towards the junction, this time turning right onto the Peak Forest Canal, heading away from Manchester and towards Derbyshire and Bugsworth Basin. 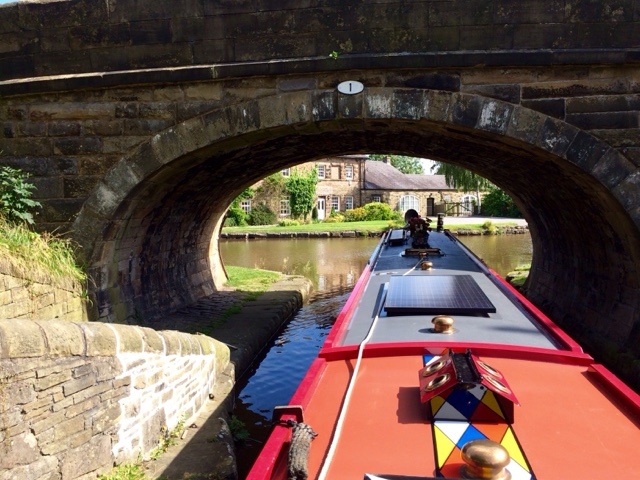 Joining the Peak Forest Canal. 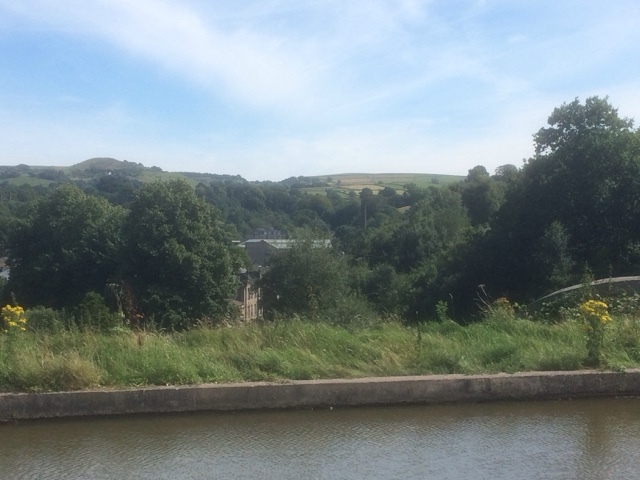 Looking left towards the Marple Lock Flight. 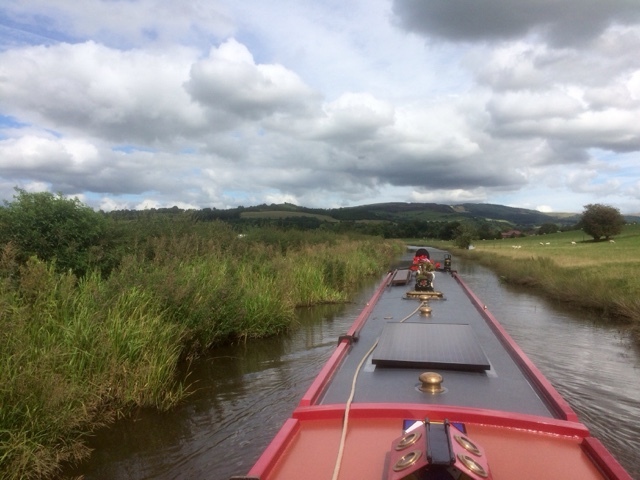 Soon after turning onto the Peak Forest, we were reminded of our trip on the Llangollen Canal last year, as we bumped and scraped along the canal bed in places. The Macclesfield Canal has been shallow, but this one is worse. 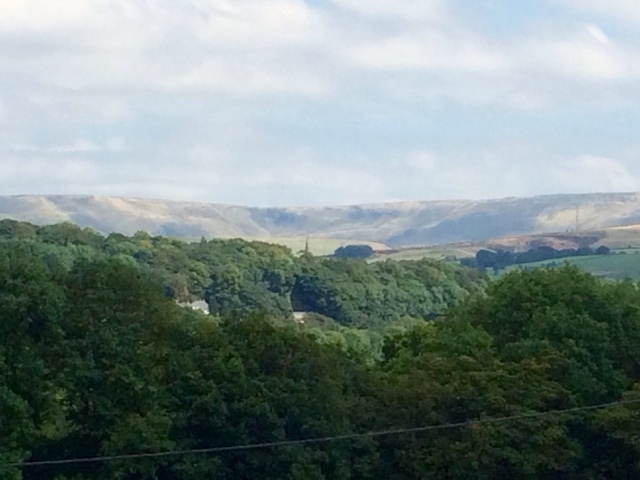 The scenery however, makes up for the shallowness, as we catch glimpses of 'the peaks' on the horizon. We were also logged by CRT on this stretch. It has been a while since we were last recorded. We attempted to moor in a couple of places, not recorded as official mooring spots in the guides, but on each attempt we ran aground. 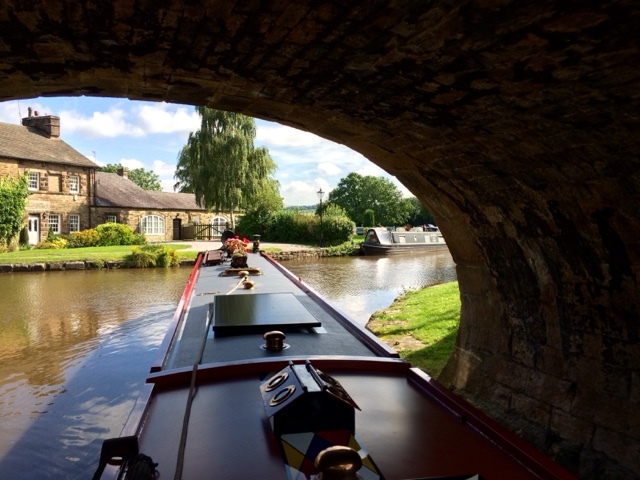 Eventually perseverance paid off, and we successfully moored close to the village of Disley. Tomorrow rain is forecast, so we will stay put until Friday, when we will set off for the end of the canal at Bugsworth Basin. Yesterday we broke a golden rule of ours, we travelled in the rain. The reasons were due to bad weather the last couple of days, we had stayed just longer than the 48 hours allowed at the Wood Lane moorings, ( albeit we were the only boat on the mooring ) we needed to pump out the waste tank, we only planned to travel one mile, and the forecast had said it would be light rain only. We moved off through the bridge ahead of the mooring, and onto the service pontoon at Lyme View Marina. The tank was emptied in no time, and we were on our way. It was raining, and it began to get heavier. Still only half a mile to go, to moorings by a wide section of canal at Higher Poynton. Unfortunately it was full, chockablock. We stopped at the water point adjacent to the short arm at Lord Vernons Wharf, where Braidbar boats are fitted out, hoping that by the time we had to move on, the rain might have stopped. It was not to be, it got heavier still. A mile further on the next village was High Lane. Here there was still some space. So now dripping wet, we secured the boat and settled down to watch the last two instalments of the Harry Potter film set. Today the weather was fine a dry. We walked the furry crew member back to Higher Poynton, to visit the Boars Head P.H. for lunch, and then ice cream at the Trading Post, next to Braidbar Boats. The Trading Post is a small cafe/chandlers/grocery store, with a number of tables outside where you can sit by the canal and watch the world go by. We also noted quite a few Braidbar boats in the vicinity, gathering no doubt for their open day next weekend. Where we are moored currently is a short distance from a number of shops and takeaway restaurants. We may treat ourselves to one tonight. 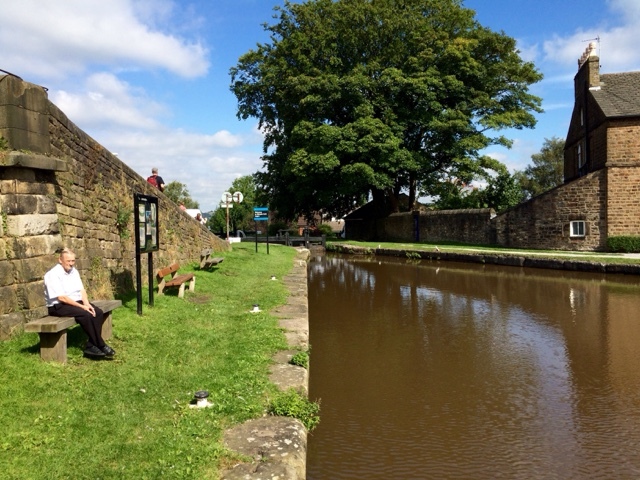 Tomorrow we plan to travel up to Marple and then onto the Peak Forest Canal. 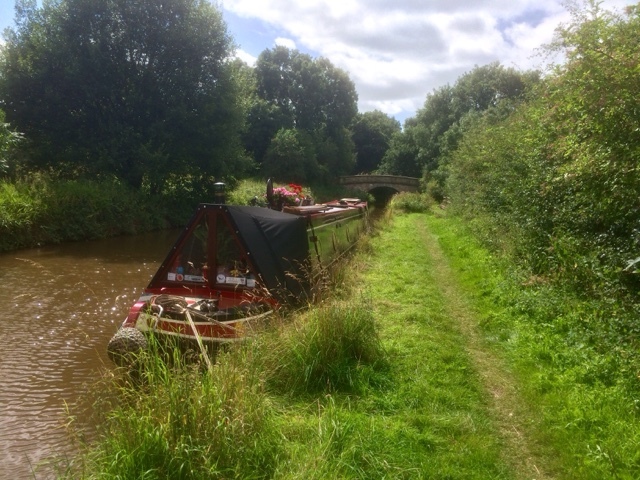 Yesterday, in anticipation of some impending bad weather due in the next few days, we moved off from the mooring at Bollington. We were only travelling 3 miles, so just under an hour after we set off we arrived at our intended destination, close to Lyme View Marina. The visitor moorings here are located either side of bridge 18, and apart from one solitary plastic boat which looks like it has been here quite a while, we were on our own. Just beyond the bridge is Lyme View Marina which has full services, and the local village a couple of hundred yards away, benefits from the Miners Arms P.H. 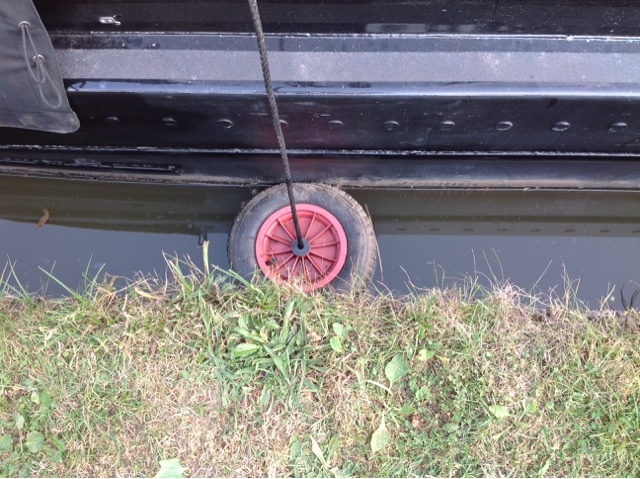 Whilst the mooring spot has rings, and a well tended grassy towpath, it also suffers from a submerged shelf below the waterline, rather like the one found on the Shropshire Union Canal. Following a rummage in the gas locker/bulk storage area, we located our Shropshire Union wheelbarrow wheels, and the problem of the shelf was solved. Now we just have to 'mind the gap' when stepping off. As we were finishing securing the boat, another went past and the steerer, clearly with some local knowledge said, "ah you have found the shelf, you know, just through the bridge there isn't one". That may explain the reason why the mooring section the other side of the bridge is time limited to 24 hours. Today the rain arrived, and it looks set like this for a while. We will sit out the bad weather here for the next couple of days, and no doubt will support the local business in the village. One other milestone was passed on our journey yesterday, our beta marine engine has now completed its first one thousand hours of use. This also means an oil and filter change is now due. We had a leisurely start to the day, it was 10 am before we got underway. We travelled back passing Gurnett, before arriving in Macclesfield. Our first stop was by the water point, close to the 'Hovis Mill'. It was built in the 1820s and was the birthplace of the famous flour. 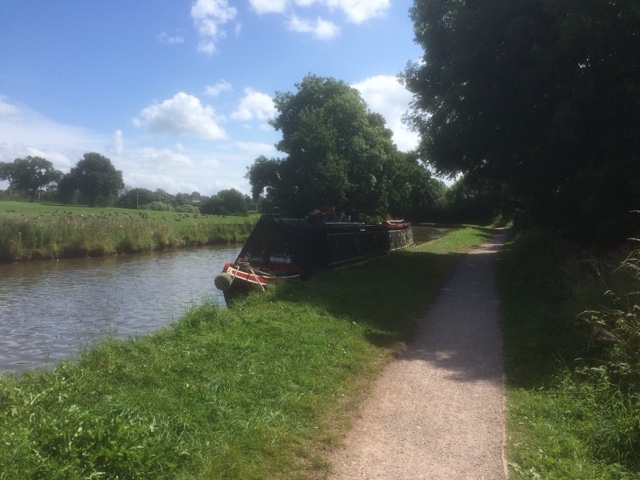 A couple of boats passed by whilst there, but generally the canal is fairly quiet. Leaving Macclesfield behind we were soon into open countryside, and getting ever closer to the boundary of the 'Peak District National Park'. The scenery is getting better the further north we go. 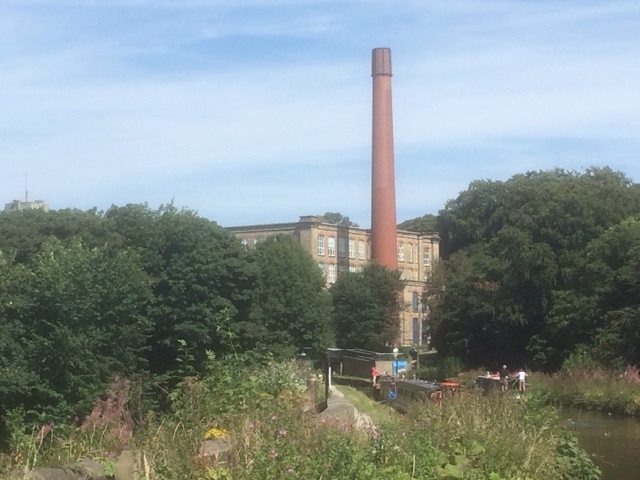 Arriving at Bollington we passed the 'Adelphi Mill', formerly a silk mill, now converted to offices, then passed over Bollington Aquaduct, before arriving at our spot in the shadow of the 'Clarence Mill'. Viewing down the valley from the Aquaduct. 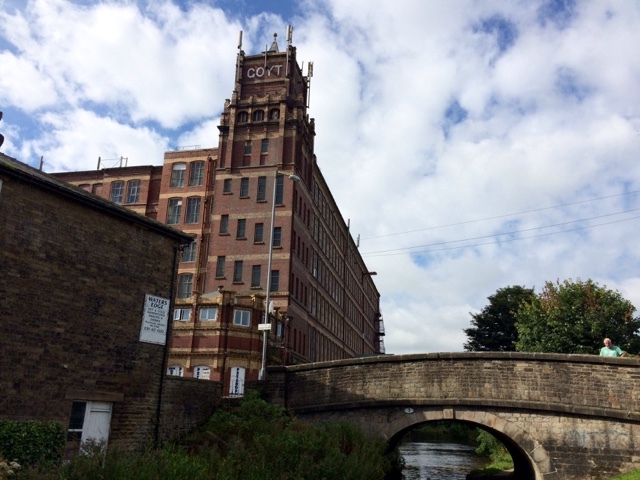 Clarence Mill was formerly a textile mill, and just one of many that used to operate in the local area. 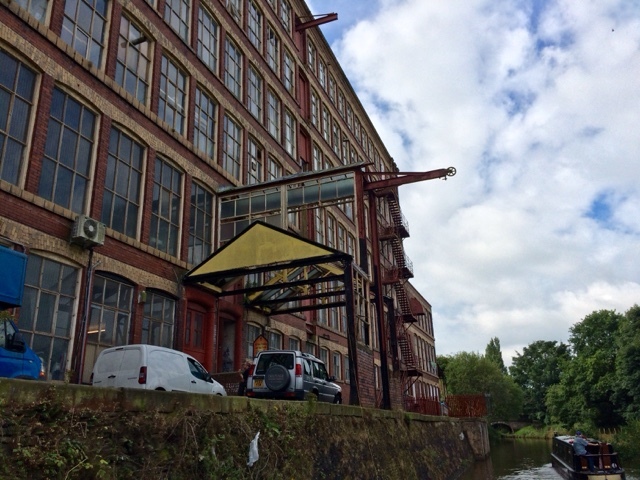 Now converted into small business units, it along with Adelphi Mill were erected by the Swindells family during the middle of the 19th C. Our plan is to stay put a day or so exploring Bollington, and may be visiting 'White Nancy' a monument built by the Gaskell family, overlooking the town to commemorate the Battle of Waterloo. Yesterday was a longish day for us due to circumstances beyond our control. 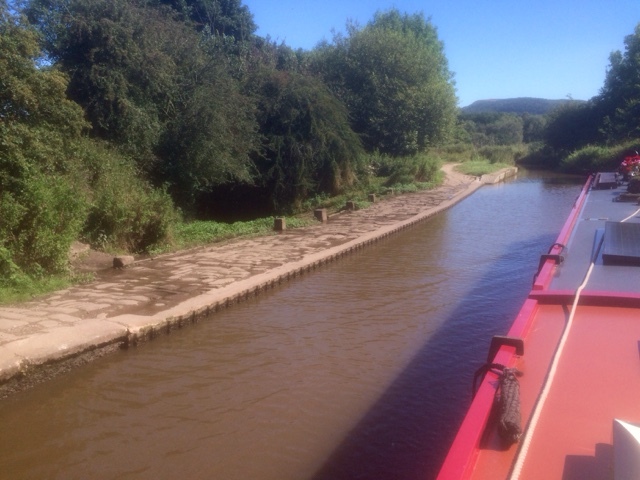 We woke to bright sunshine, but with the twelve locks of the Bosley flight to do, this was not necessarily a good thing, as it could get very warm. Slipping a way from the mooring, we moved towards the first lock which was set for us with gates open. 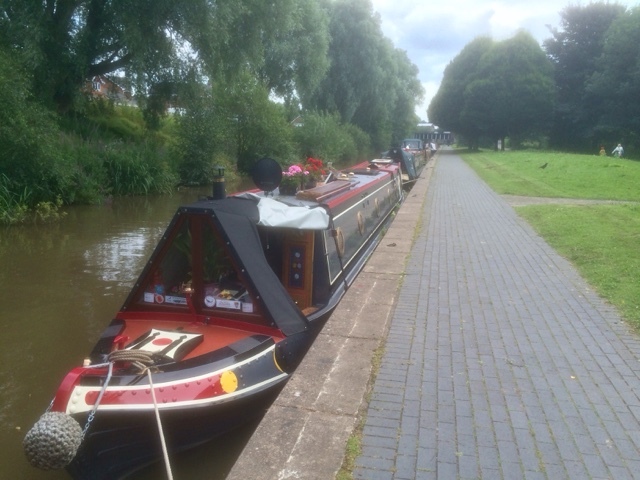 It transpired that a hire boat crew had been practising their lock operation, prior to commencing their first lock experience, but had to walk back some distance to where their boat was still moored and we were to benefit from it. Feeling a little guilty, and as no boats were opposing, we did turn each lock for them as we exited. The reason for no opposing boats was to become apparent all to soon. Speeding our way up the flight, it all came to an abrupt halt at lock five. Ahead in lock four there was another boat, nb.What a Lark. They had been there for two hours. Further up the flight, lock three had problems with a broken paddle, and the Canal and River Trust were busy trying to repair it. We were going no further for some time. Halfway up but no further for a while. Then came some worse news, it was not just the paddle that was the problem, it was the frame which holds it in place that had broken away. 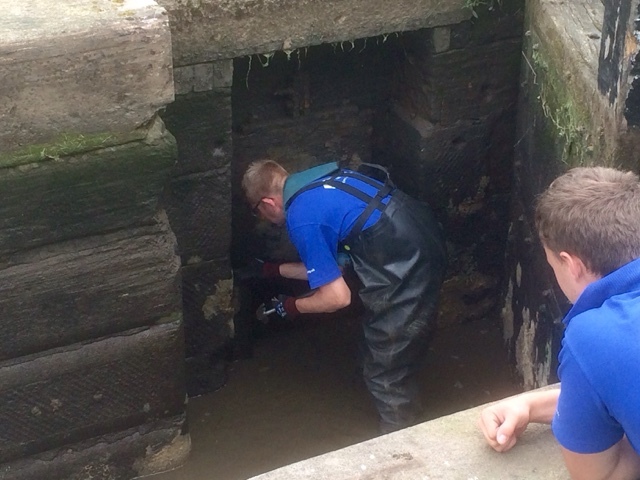 CRT staff were in their waders attempting a fix with some long nails, and a small hammer. Fixing the paddle frame back in place. All fixed, let's hope it holds. 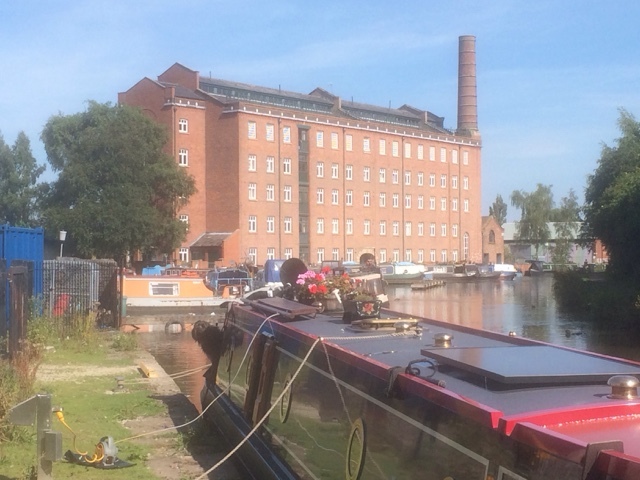 Now we just had to wait for the pound above lock three to be refilled, and for the first boat, which happened to be the coal boat Halsall, to descend. Three and a half hours after first arriving at lock five we were finally underway again. It could have been worse, so credit to CRT for sorting it quickly. Once at the top of the flight we filled the tank with water, before continuing towards Gurnett. The water tap here is the fastest we have encountered, usually when they are turned on it trickles into the tank. Not so this one. 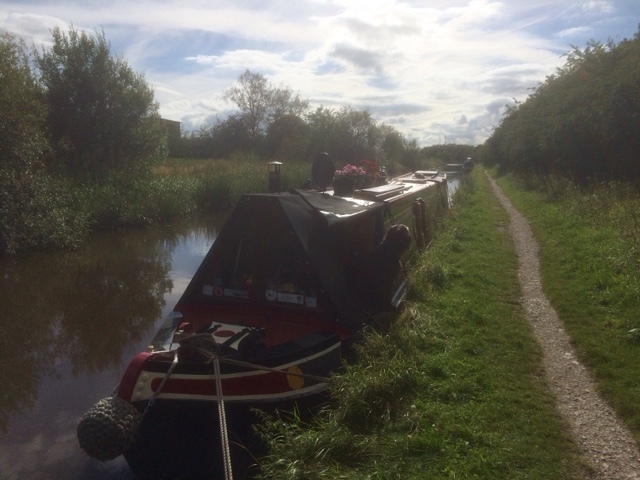 Due to our delay we arrived at our intended spot quite late in the day and found the entire mooring full, nb.What a Lark had just fitted onto the end of the line. 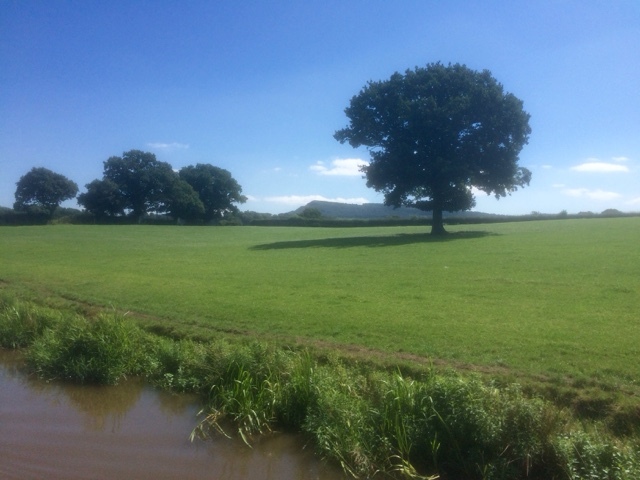 We carried on into Macclesfield but there were not any suitable spots, so we winded about a mile further on and returned, passing Gurnett on a return journey to a mooring near Lyme Green. This is about a mile from today's lunch location, but will at least allow us to walk off the pudding we are going to have. The mooring is close to a retail park so yesterday's tea was taken at Burger King. It also has a good satellite signal for the TV and 4G. What a difference a day makes. 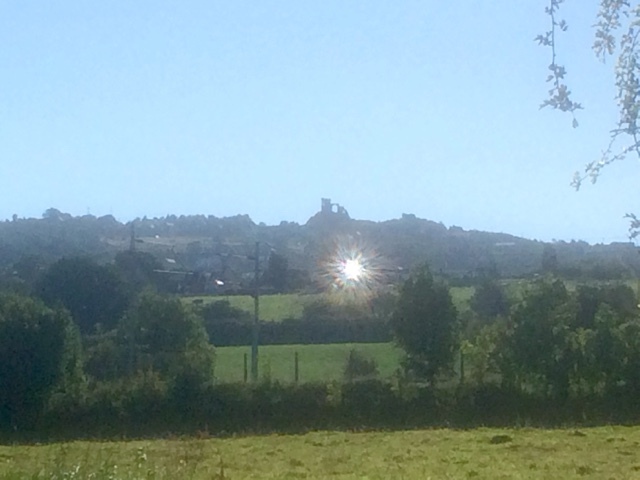 Woke this morning to warm bright sunshine, and we were finally able to see the ruins of Mow Cop Castle, on the top of the hill adjacent to our mooring. Last night we had been researching locations for a Sunday roast, and have decided on the Kings Head P.H. at Gurnett. 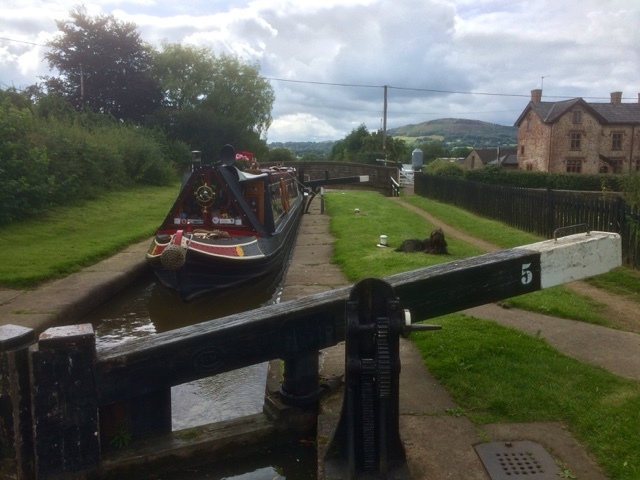 This is however two days travelling for us, so after breakfast we got underway for the first leg, seven miles through the countryside, to the foot of Bosley Locks. 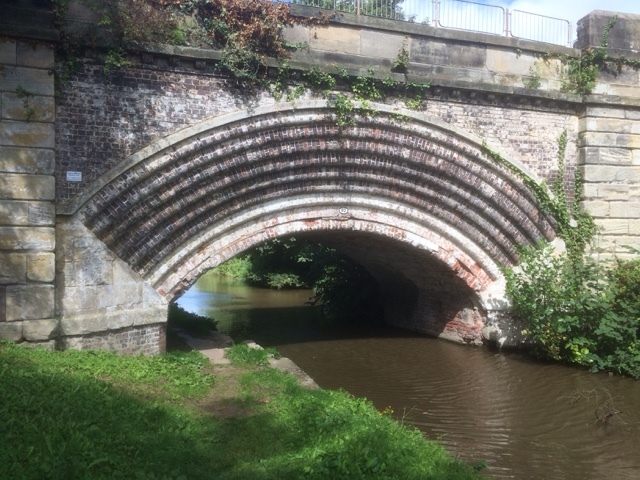 The Macclesfield Canal is a very pretty canal, with stone bridges and a rural backwater feel to it. The milestones also have the appearance of tombstones, peeking out from the undergrowth. We passed an interesting spill weir, this is where the water level of the canal is maintained allowing water to flow over the top once I reaches a certain height. They don't usually form part of the towpath like the one above. Walkers are in danger of getting wet feet when boats pass by. 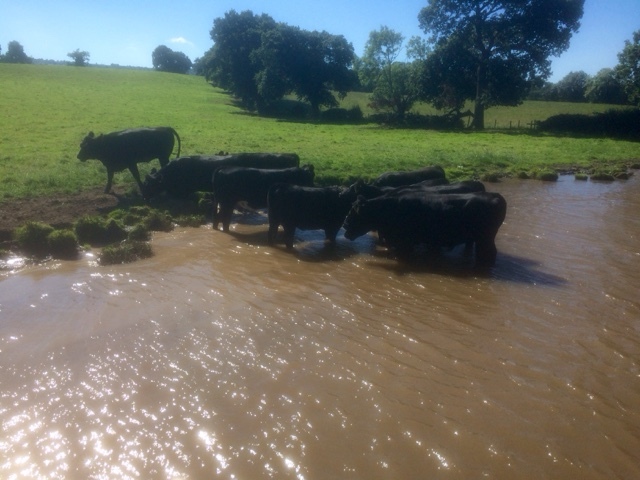 Next were some very handsome looking black cows having a paddle and a drink. The terrain is becoming increasingly hilly, as we travel further north. 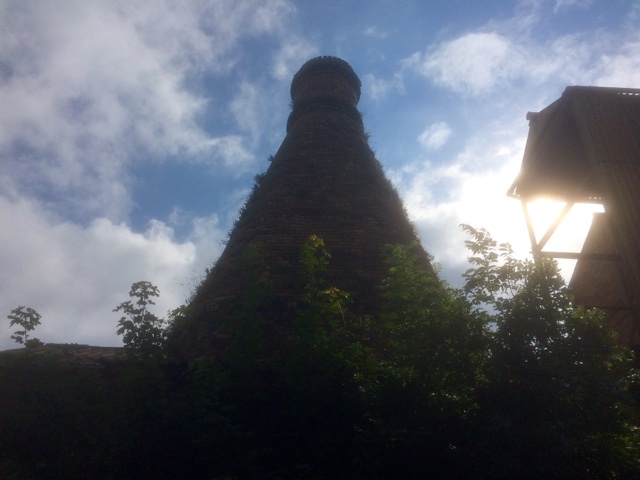 We passed through the town of Congleton and then Buglawton village, on occasions experiencing the shallowness of the Macclesfield, in particular whilst passing through the bridge holes. During our journey we tried out a few mooring spots for future reference, some were successful, and some we ran aground. Soon we caught a glimpse of 'The Cloud' a fell at over 1000 feet above sea level. 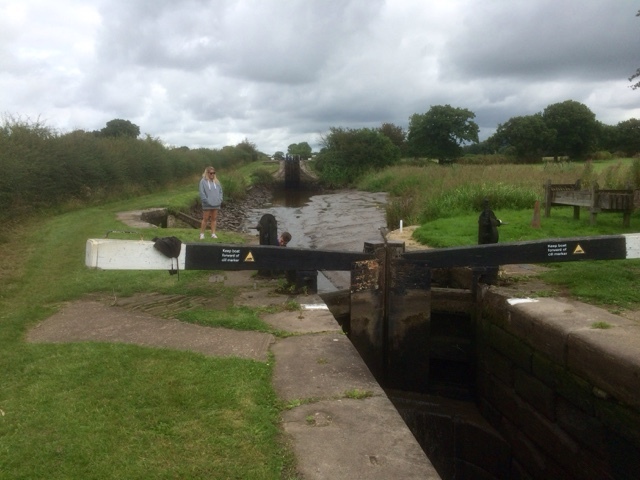 About three hours after setting off, we arrived at the foot of Bosley Locks. There are twelve in all, raising the canal by 118 feet. Today we walked up them, just to see what tomorrow would entail. Oscar seemed to enjoy his walk, finding a favourite stick to chew on, in between slurps of canal water. Viewing back down the flight. Tomorrow we will aim for Gurnett Aquaduct and once there settle for a couple of days. Early next week the weather is forecast to be hot and the brass needs a polish. 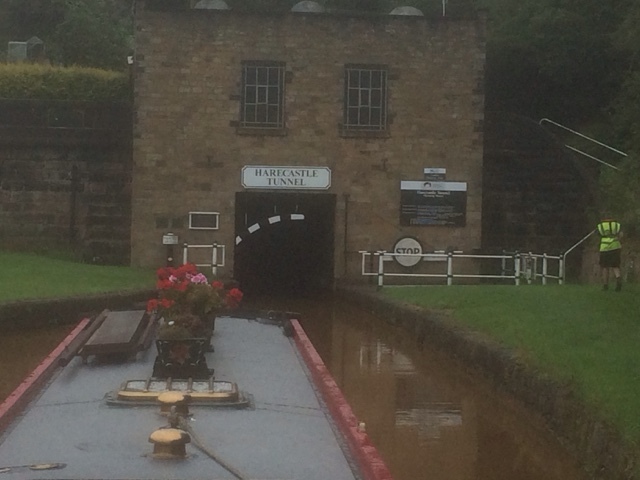 Today we made our turn onto the Macclesfield Canal, but first we had Harecastle Tunnel to navigate. At 2926 yards it is the longest tunnel passage we have made so far. The weather as we departed Westport Lake was grey and gloomy, with rain threatening to make an appearance at any time. This did not matter so much, as nearly one third of our day would be spent underground. On arrival at the tunnel entrance we just caught the tail end of a boat, disappearing into the tunnel. We moored up to speak with the friendly tunnel keeper, who was Naomi, and she then gave us a safety briefing. The good news was, the boat we saw entering the tunnel was number six in the convoy, meaning we could continue without waiting, as the maximum convoy length is eight. We removed the satellite dish and chimney, to enable us to pass beneath the black and white striped gauging arch at the entrance, and that was it, we were on our way through. Harecastle Tunnel - Southern Portal. Once inside the tunnel, the pair of doors at the entrance were closed behind us, and large and very noisy fan was started to provide ventilation. The tunnel is single way traffic, although once beyond the narrow entrance it opens up to about 14 feet in width. This is due to it having had a towpath in the past, which has long since been removed. By the time we reached halfway the noise of the fans had almost disappeared, but the ever constant draft made it a chilly passage. The water was also starting to become rusty brown in colour. Just under five hundred yards from the exit, we saw the famous skeleton that is painted on the wall. We passed too quickly to get a photo, but now we know where he is, we will get one on the way back. About forty minutes after beginning the passage, we emerged from the northern portal and immediately noticed the colour of the water. Harecastle Tunnel - Northern Portal. 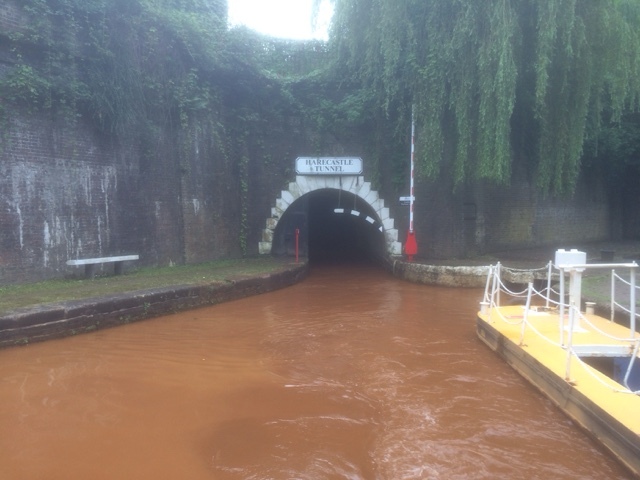 This rusty colour is caused by the iron ore found in the local region leeching into the canal. The queue of boats waiting to head south was into double figures, so some of them would have a long wait. A few hundred yards further on, was Hardings Wood Junction where the Macclesfield Canal leaves the Trent and Mersey. We made the left turn after a brief wait due to some traffic congestion. 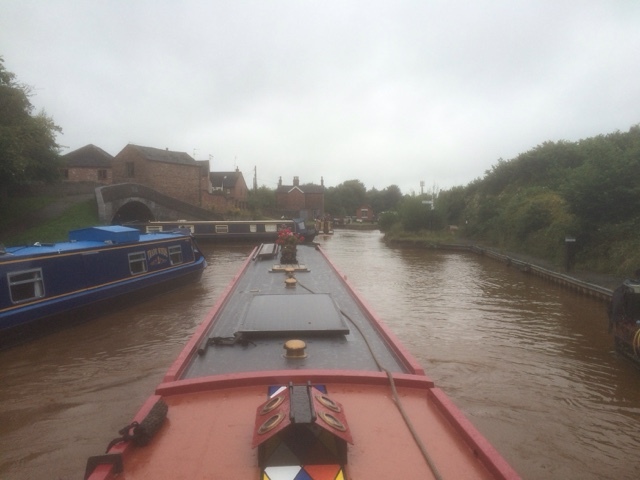 The two canals run parallel for about 400 yards during which time the Trent and Mersey is lowered by two locks. The Macclesfield then passes over the top of the T&M via an Aquaduct, and continues its journey north into open countryside. 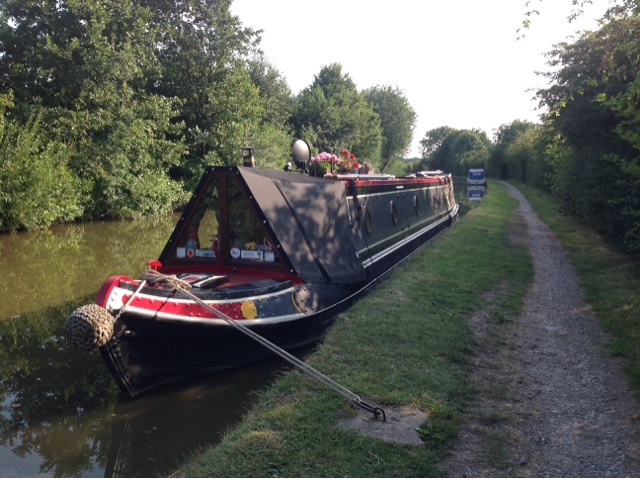 We navigated the stop lock at Hall Green, and then filled the tank with water, before continuing the short distance to Scholar Green at bridge 87. Here we secured the boat, then headed off to the Rising Sun P.H. for lunch. The pub is dog friendly although we had left Oscar behind, and it has an extensive menu of home cooked dishes. 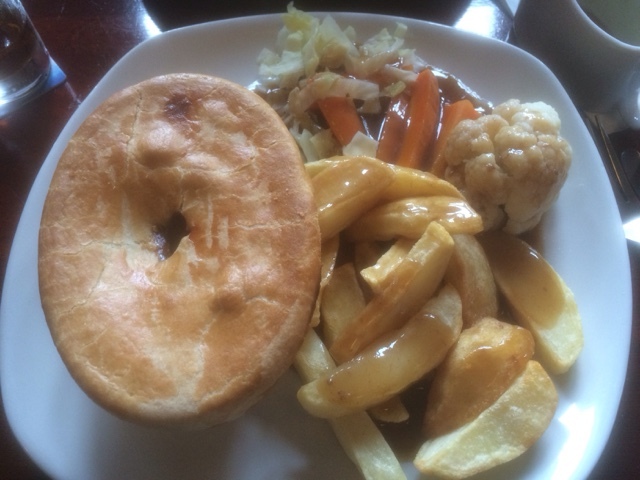 The steak and ale pie was my choice, due in part to it being a cold, wet, miserable day. 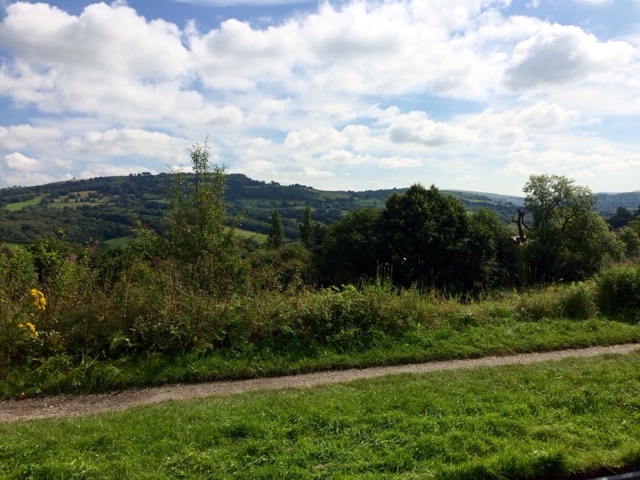 We are moored adjacent to Mow Cop, a hill, the top of which is 1100 feet above sea level. On the top is the ruin of Mow Cop Castle, which we can't see today as it is shrouded in cloud. We plan to stay here a day or so and hopefully the weather will improve before we leave. Today we had out first city to navigate through, Stoke on Trent. We had heard various stories about it so opted for an earlyish start. 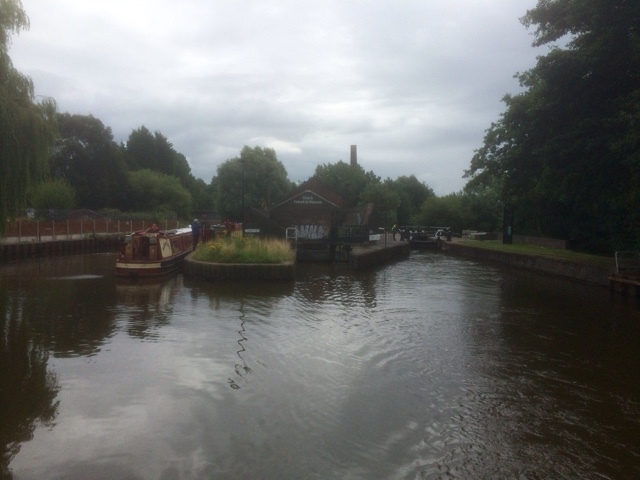 No sooner had we moved off towards Trentham Lock, we passed nb Amyjo who are fellow bloggers, and whose far more extensive blog, including video clips can be found in my blog list. We had a brief chat, having missed the opportunity last year when we were up near Chester. 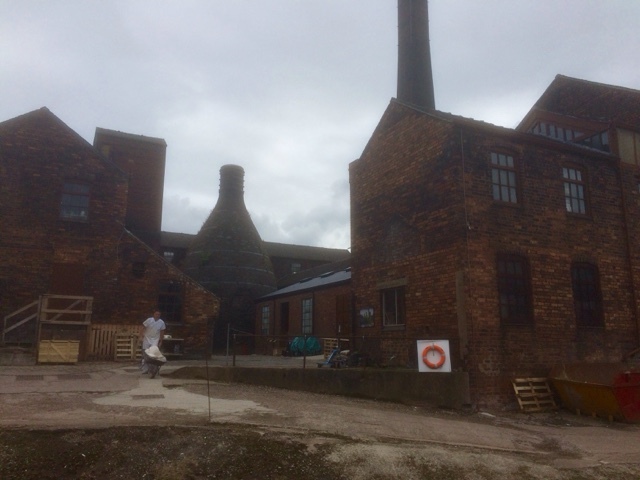 Just prior to the first lock we encountered a factory which is one of many that gave Stoke on Trent its nickname 'the potteries'. Through Trentham Lock, we were soon into the suburbs of the the city. The first large building passed was a waste incinerator. 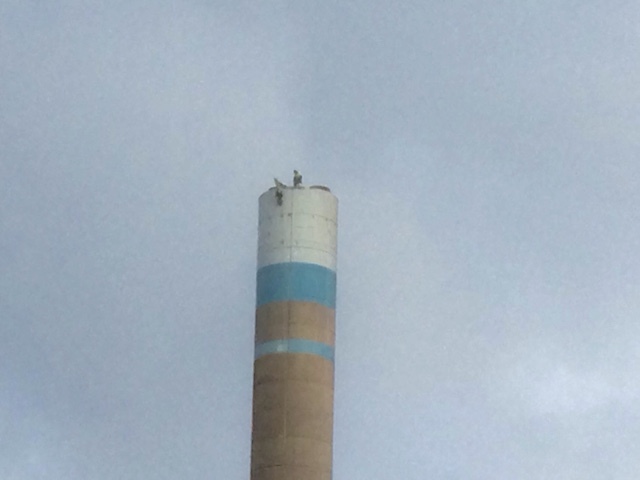 As we got closer we could see some work being carried out at the top of the chimney stack. A head for heights would be a must in this job. 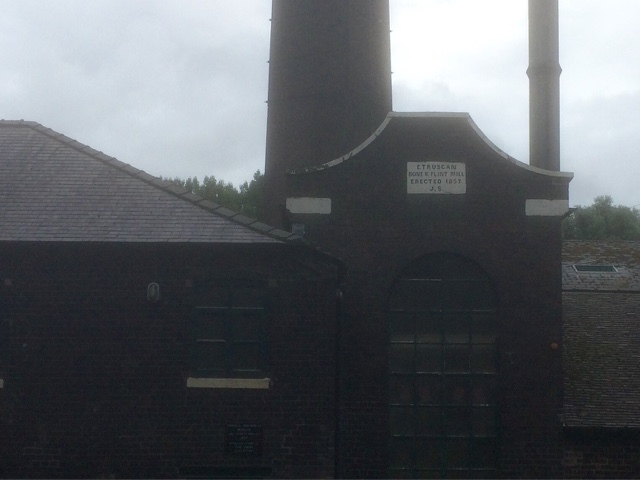 Once we had passed through the newer industrial areas of Stoke, we began to encounter some remnants of the industrial past. 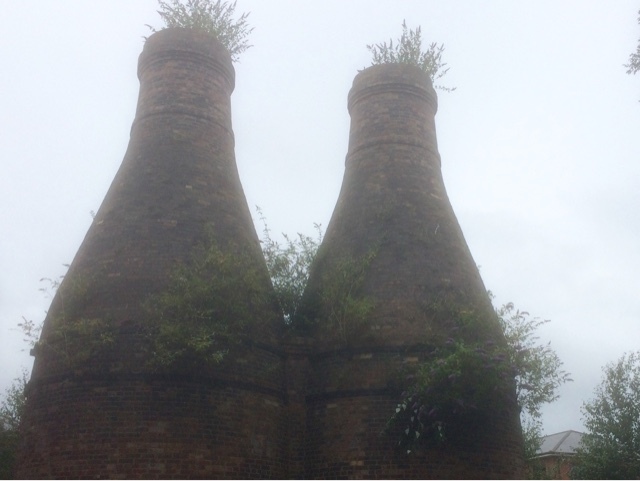 Bottle kilns used in the firing of pottery, are found intermixed with the modern city. We had six locks to navigate today, the deepest of which were the Stoke flight, consisting of three locks, which raise the canal by 50 feet. 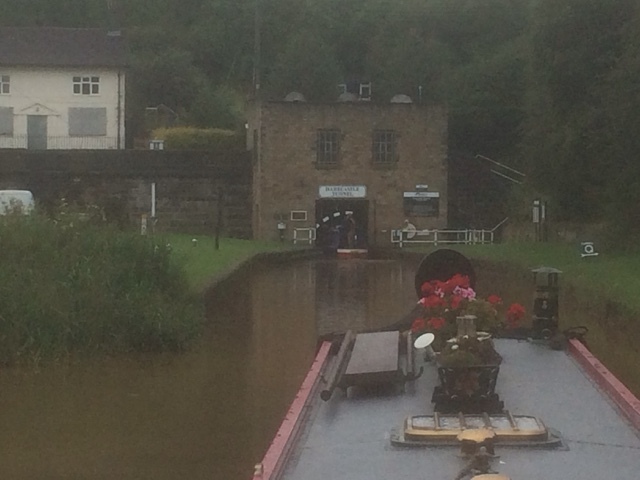 The final two locks were operated by CRT volunteers, and the top lock is reportedly the third deepest narrow lock, on the entire network. More examples of past industry were evident at Eturia Junction. This is where the Caldon Canal leaves the Trent and Mersey heading towards Leek and Froghall. We had passed several of the well known and famous makers of pots, including Wedgwood, Royal Doulton and Spode. 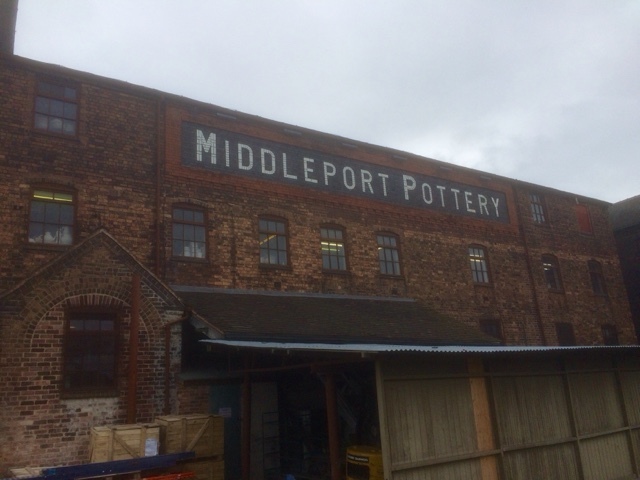 Then right next to the canal it was the turn of Middleport Pottery. Soon after passing this pottery, we arrived out our mooring spot by Westport Lake. This is about a mile before Harecastle Tunnel which we will travel through tomorrow. 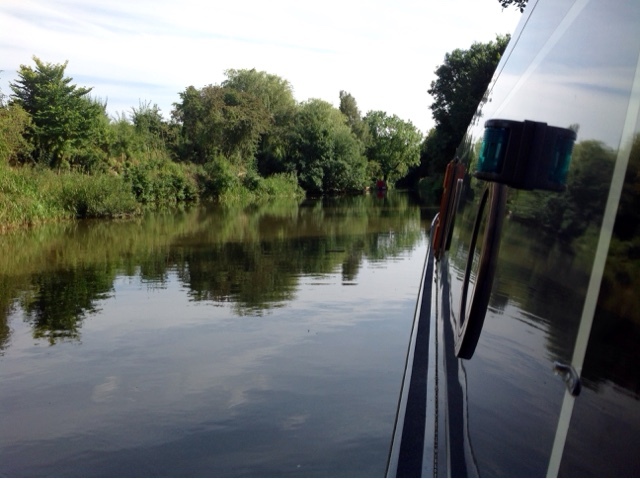 The mooring here is about 200 yards long, and when we arrived we were the third boat. An hour later, after lunch and a walk round the lake, the whole length of the mooring was full, with further boats breasted up in places. It seems this is a popular spot. Leaving Aston Marina this morning we edged our nose out onto the cut, just as Tamora No.2 passed by, pipping us to the lock. 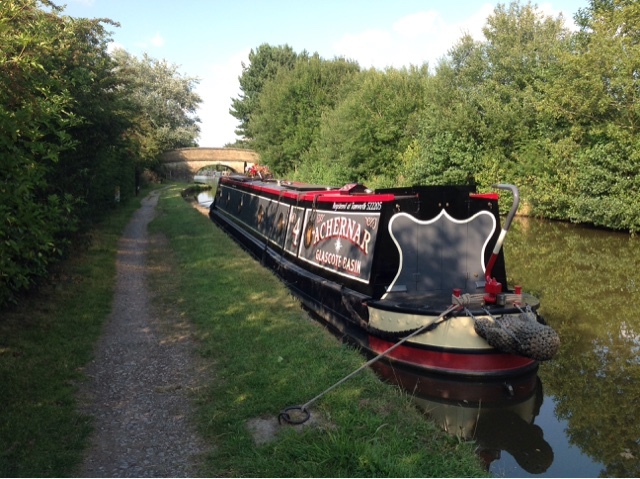 We had not seen them since the Glascote weekend, and now they were ahead of us also heading as far as Barlaston. 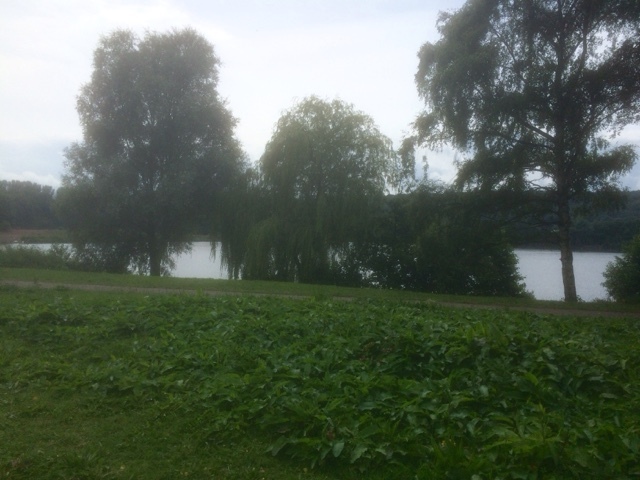 We travelled on along the Trent Valley, running parallel to the river until arriving at Stone. We had four locks of the Stone flight, and a further four at the Meaford flight to complete before the final leg into Barlaston. 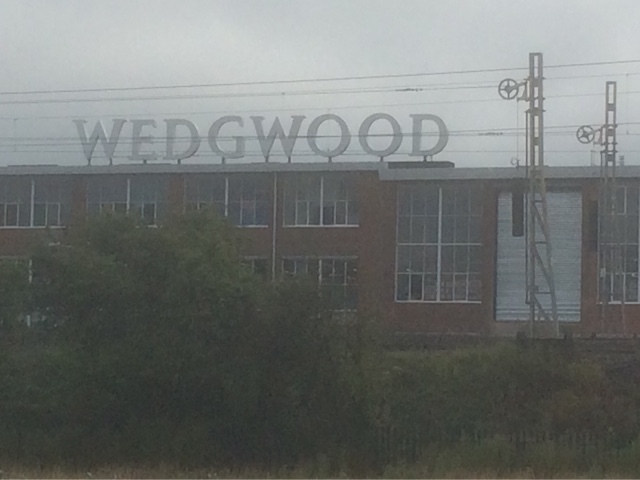 We found a mooring just outside the village close to the Wedgwood factory, famous for its bone china. 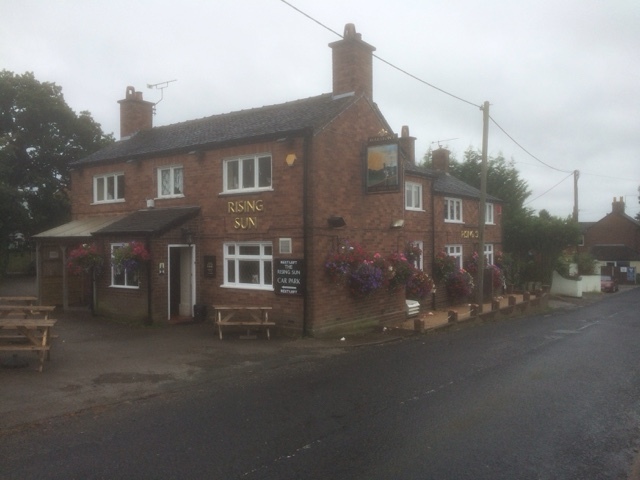 Later we walked back into Barlaston and had a drink at the Plume of Feathers P.H. Unfortunately its owner, Neil Morrissey of Men Behaving Badly fame, was not present today. 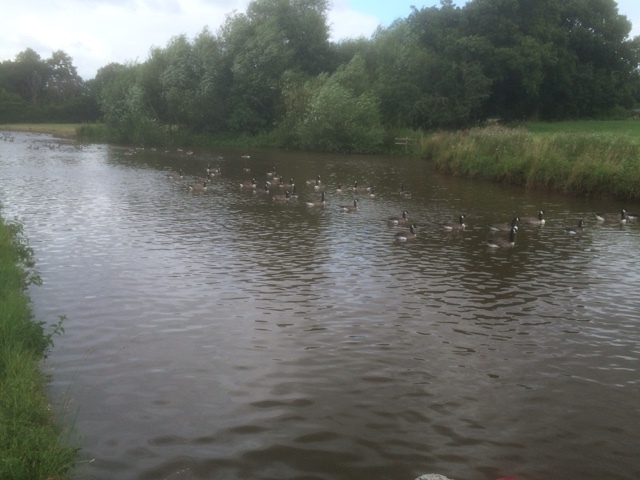 Our mooring is adjacent to a field, which on arrival contained about 100 Canada geese. You can just see the geese in the background. On our return from the pub it was apparent that several more of their mates had decided to turn up. I just hope this lot don't start squawking during the dawn chorus in the early hours of tomorrow morning. If so I suspect we will be underway by 5am. Sunday lunch at the Saracens Head was very enjoyable, and whilst we had left the furry crew mate on board the boat, this pub is dog friendly for future reference. 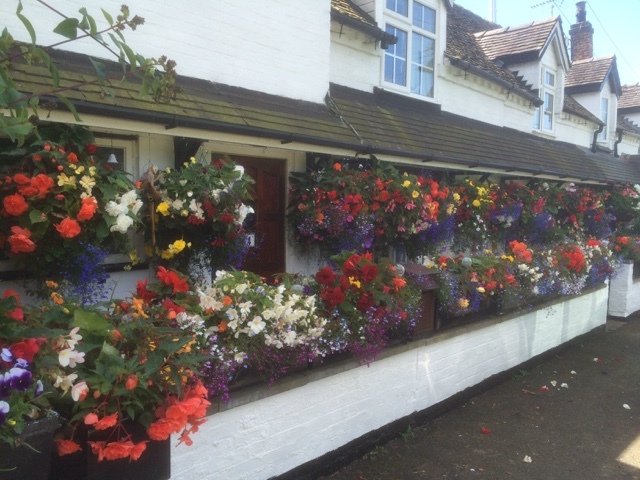 On the way back to the boat, we passed a row of cottages that seemed to be in competition with each other, as to who could have the most colourful display of flowers. This morning the alarm went off at a very unpleasant 7.50 am. 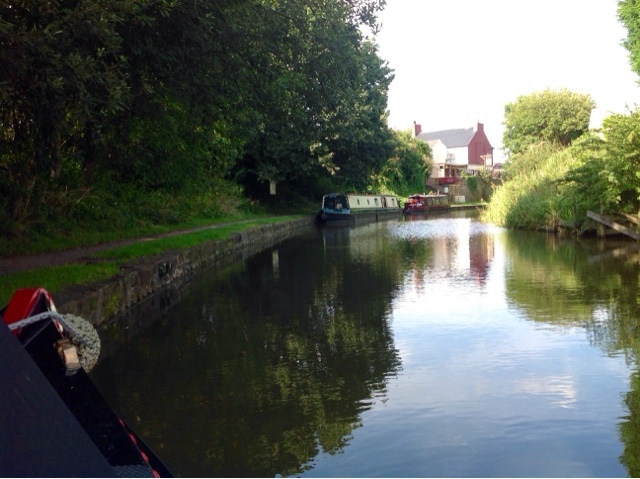 We had set it because we intended to reach the village of Barlaston, a good view miles and quite a few locks away. By 8.30 we were underway, the weather was still blustery and clouds threatened rain. This was not the weather BBCs countryfile had forecast. The first bridge we passed through demonstrated intricate brick work skills which appear to be lost on more modern constructions. As we were passing between bridges 84 and 85 it began to rain. We stopped for a tea break before commencing our journey half an hour later. Approaching Aston Marina we could see the lock ahead, and there appeared to be some boat shuffling occurring. There were also a number of people standing by the lock wearing blue Canal and River Trust shirts and red life jackets. 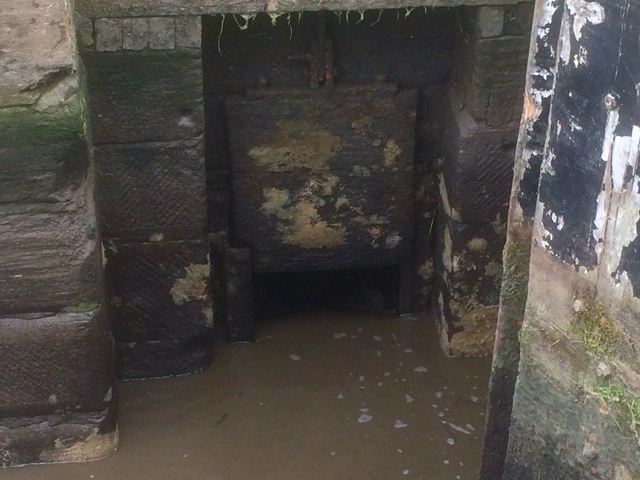 We were informed the lock had just been closed to navigation, and it was expected to be an hour at least before it opened again. 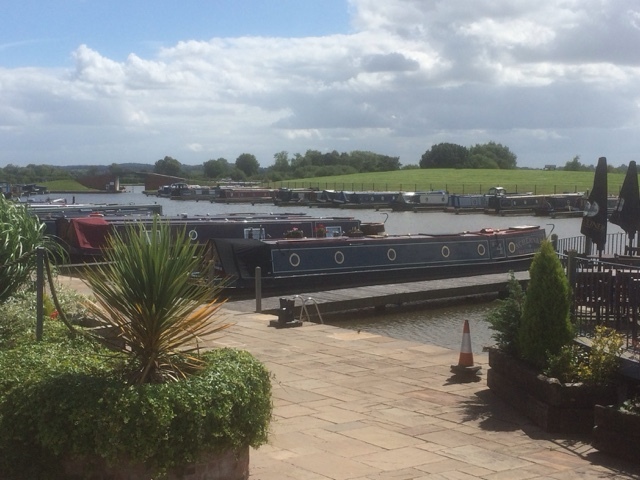 Deciding not to waste time in a queue, we turned swiftly into the Marina and located their service pontoon for diesel and a pump out. Whilst completing our tasks, we were informed that the Marina hosts a bistro and well stocked deli. Hearing this we plonked ourselves on the visitor pontoon and booked a berth for the night. 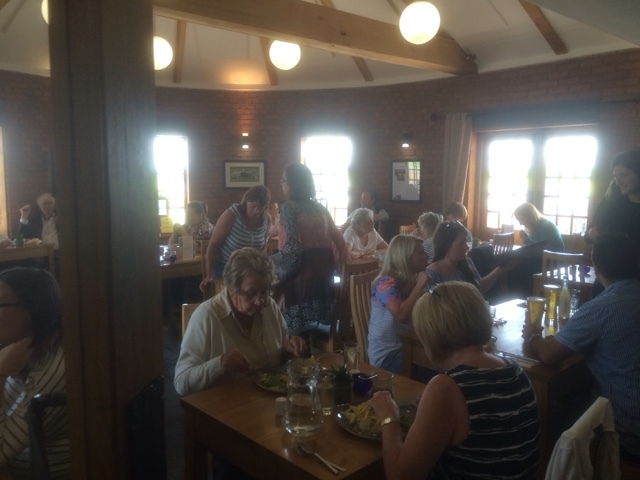 Then it was off to the bistro for lunch. After lunch the four legged crew was taken for a walk, then the afternoon was spent resting and relaxing in anticipation of our busy day tomorrow.